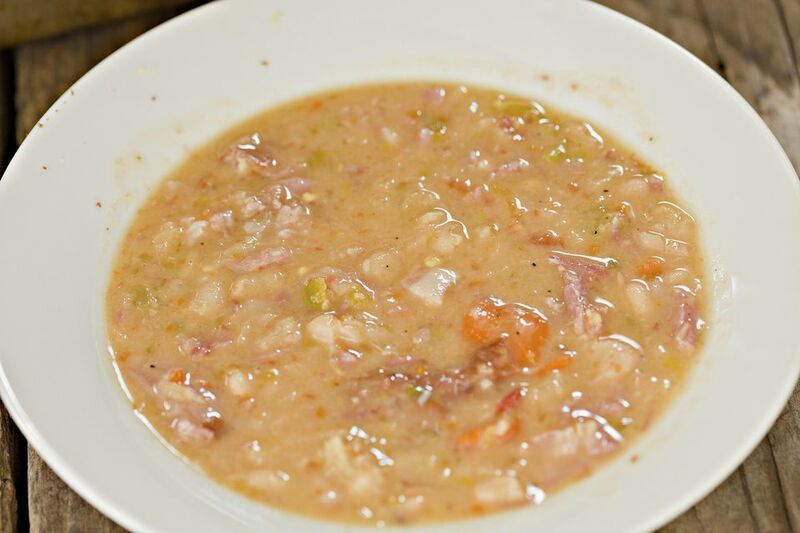 This old-fashioned bean and bacon soup recipe is so delicious that you'll never go back to canned. This soup is the most warming and comforting dish to serve on a cold winter day, and it's easy to make. The beans do have to soak for an hour before you start making the soup, so use that time to cook the bacon and prepare and cook the vegetables. Serve with a pan of warm cornbread right out of the oven for a delicious meal. Combine beans, 2 quarts water, and 4 cups chicken broth in large pot. Bring to a boil and boil for 2 minutes. Cover and let stand for 1 hour. Cook bacon until crisp in a large stockpot. Remove bacon to paper towels to drain and crumble; set aside. Add chopped onions and minced garlic to bacon drippings. Cook and stir until onions are tender. Add partially cooked beans and cooking liquid to the onion mixture. Cover and cook over low heat for 1 hour. Add remaining ingredients including reserved bacon pieces, except for sour cream, cornstarch, and Tabasco sauce. Cover and simmer for 50 to 55 minutes, stirring occasionally, until beans are tender and soup is slightly thickened. Remove bay leaf and discard. Combine sour cream and cornstarch in small bowl; mix well. Add 1 ladle of the soup to the cornstarch mixture and stir until combined. Stir this mixture into the soup and simmer for 5 minutes. Season to taste with Tabasco sauce and serve.